Depending on your take on events the toll has been as high as two Prime Ministers and one Leader of the Opposition, but Australia now has a carbon pricing mechanism operating in the economy (I say “now” in that even though it doesn’t formally start until July, the price exposure for companies was there the instant the law was officially passed). 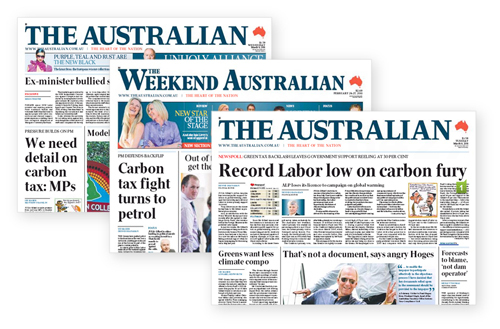 There does remain some uncertainty given the “blood oath” made by the current Opposition Leader to repeal the law, but at least for now the business playing field in Australia has changed. The mechanism starts next July and is structured such that it transitions to an emissions trading system a few years later. This means that from the outset the approach is allowance based, with the government selling allowances at AU$23 per tonne of CO2 and then the same allowances being returned to government for emissions compliance. Somewhere around 2015 this will change in that the number of allowances available for distribution will be capped and banking of allowances, together with an opportunity to use offsets, will be allowed. Australia has followed a near text-book approach to implementation as it has decided to recycle the funds collected directly back to consumers affected by the carbon price in the form of tax changes, with a bias towards those on lower incomes. Trade exposed industries will also see a direct recycle back, thus minimising the change in their international competitive positioning. The approach adopted by the government follows the cycle discussed in the WBCSD publication Carbon Pricing released earlier this year. 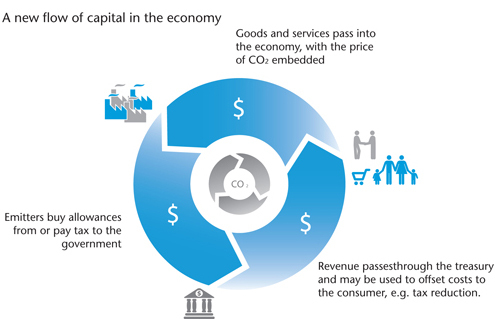 The goal of a carbon price is to create a change in the economy such that the market begins to differentiate between goods and services on the basis of their carbon footprint. In its generic realization, the carbon price, initially experienced by the emitter or fuel provider (e.g. by paying a tax, purchasing allowances from the government or implementing a required project), is passed through to the consumers of the product. The result is a change in the relative cost of most goods and services based on their carbon footprint, and the emergence of a new cost ranking within the economy. This will influence the purchasing decisions of consumers. Products with a high carbon footprint will be less competitive, either forcing their removal from the market, or driving manufacturers to invest in projects to lower the footprint. Any revenue raised by the government from carbon pricing, will be typically directed to the treasury as part of the overall national budget process. It should be used efficiently; for example, to offset any net change in costs to the consumer by reducing taxes. A transparent pass-through of operating costs to the consumer is an important feature of any market. It allows the manufacturer to adjust the sales price to maintain profitability, as new costs enter a process, or existing costs change. An increase in the sales price could only occur to the extent that the market allows the change to take place, due to competition from manufacturers with a different cost structure that may limit the potential for cost pass-through. 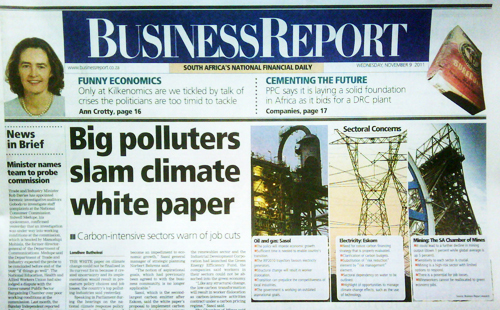 This gives rise to one of the principal challenges of introducing carbon pricing into an economy. Carbon pricing is being introduced piecemeal throughout the world. Some manufacturers incur the cost of carbon, while others do not, although they may be competing in the same market. A manufacturer incurring the cost of carbon is penalized, as the market price is set by a lower cost provider without the carbon price. This can result in “carbon leakage”, where a higher cost manufacturer struggles to compete, and market share is gained by a producer not subject to the carbon price. Consequently, the environmental integrity of the approach can be undermined and economic distortions introduced. A global carbon price is therefore important in order to gain a level playing field. Another challenge arises in heavily regulated markets where the producer may not be able to raise prices, and therefore cannot recover the carbon cost. The design of a carbon pricing policy must recognize these issues. Back in February when all this started, an observer might have thought that the economic roof had caved in. But despite the difficult politics that have surrounded the proposal (now law), the government should be applauded for persisting. Regearing the economy and creating a different set of winners (and losers) somewhere down the road is not an easy task, but it has to be done.A command and control policy set which might appear as an alternative is both more expensive for consumers and far less flexible for business. I happen to be in South Africa this week and a similar set of proposals is under discussion, although more likely implemented as a straight carbon tax. Australia and South Africa are similar in many respects – both are heavily dependent on coal and both are major resource based economies. South Africa will need to be even more thoughtful than Australia regarding recycle back into the economy, given the different income distribution in this country and the pressing need of access to electricity for all the population, but the principles which guide them should be the same. There is also the additional complication of having a state run monopoly providing electricity to the country, but even that is starting to change as the government looks at the introduction of independent renewable energy suppliers. As was the case in Australia, the battle lines are being drawn, at least according to the Cape Times today. That part of the global economy exposed to a direct carbon price remains small, but it is rising and Australia is an important step, as will be South Africa. So far this isn’t enough to change the terms of the global energy mix, but it is having regional impacts. A similar move in China and / or the USA would change all that though.